I have been wrestling with this Foundling for months as this work presented problems at every turn. 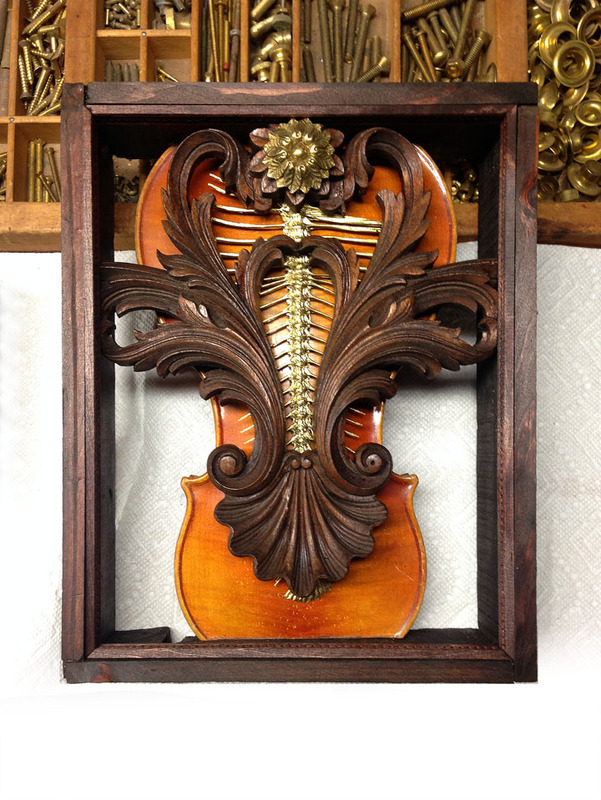 First, in choosing to use an old broken violin, the aesthetic challenge was to integrate the strong visual form into a Foundling. I was trying to find that balance where the form wasn’t hidden but wasn’t too obvious. Then there was the question of not having a back to this Foundling. Would showing the back wall help or hurt the overall appearance of this piece. This also made figuring out how to engineer this so it was solidly put together as well as figuring out how to hang this, another obstacle. Lastly, the fish bones, generously supplied by Joe Anderson and Sonja Huie, by preparing a delicious dinner, was a real pain to figure out how to get the bones not to smell (turns out a heavy duty primer did the trick). In the end, I am very pleased with how well the various textures work together (and especially pleased that I was able to finally get this together).